Apple cinnamon raisin sunflower seed oven cakes are a delightful vegan recipe for breakfast, or for any other time of day, and they can even be eaten as a cookie. This recipe will make between 6 and 12 oven cakes. Preparation time is about 15 minutes, and baking time is about 25 minutes in a preheated conventional oven at 350 degrees F.
In the container of a high speed blender place the peeled banana, dates and 1 apple (washed, cored and quartered), and add 1/4 cup of apple juice, cover, and run the blender at high speed until the contents are smooth. Set the blender on slow or chop speed and add the second apple (also washed, cored and quartered) and chip into small pieces. Set the mixture aside. In a bowl, mix the flours, baking powder and cinnamon together. Mix in the banana – date – apple mixture and sufficient additional apple juice by rinsing out the blender into the flour mixture until smooth, but on the thick side so that the mixture won’t flow out on the baking pan, if you want to make 6 thick oven cakes, or thin the batter with additional apple juice for making twelve thinner oven cakes. Stir in the sunflower seeds. On a lightly oiled or non-stick baking, spoon out about 2 or 3 heaping tablespoons of the mixture for each cake. 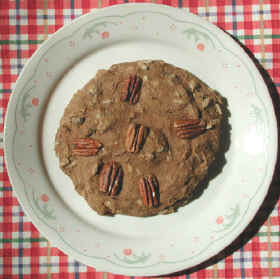 Arrange the Pecans on top for decoration and added flavor. Bake in a preheated oven at 350° F. Cook until golden brown. When the Oven Cakes are springy-firm to the touch, they should be done. The first time you make them, you might want to check the bottoms to make sure they are not burning. These Oven Cakes can be served with Maple Syrup or your favorite topping, including our own banana date syrup. Oven Cakes can even be eaten like a cookie.